I’m not THAT mom. You know, the one that doesn’t allow her kid to have any candy at all. But I am the mom that realizes she gets enough candy from too many places. That’s why I usually opt for non-candy Valentine treats. 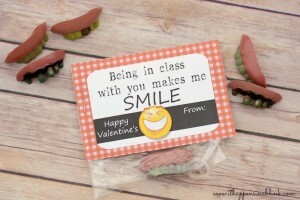 Last year, she handed out this Funny Teeth Valentine. 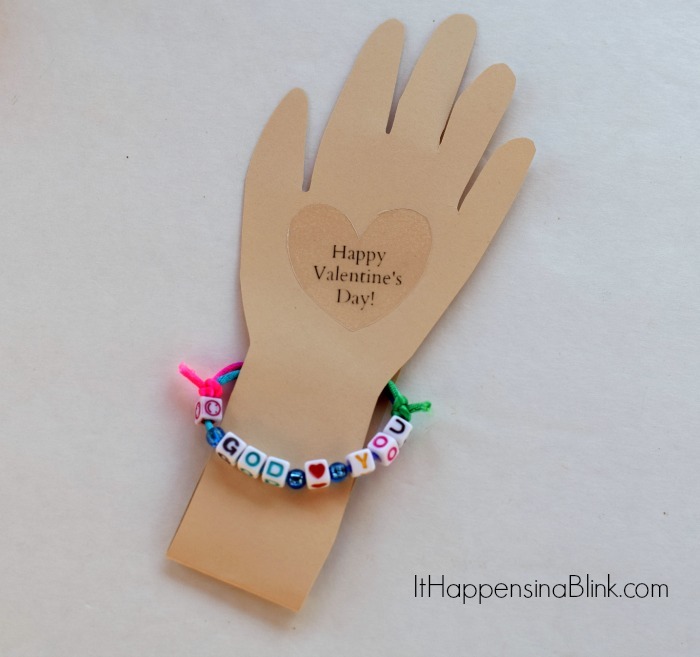 This year, she is excited to take Bracelet Classroom Valentines. 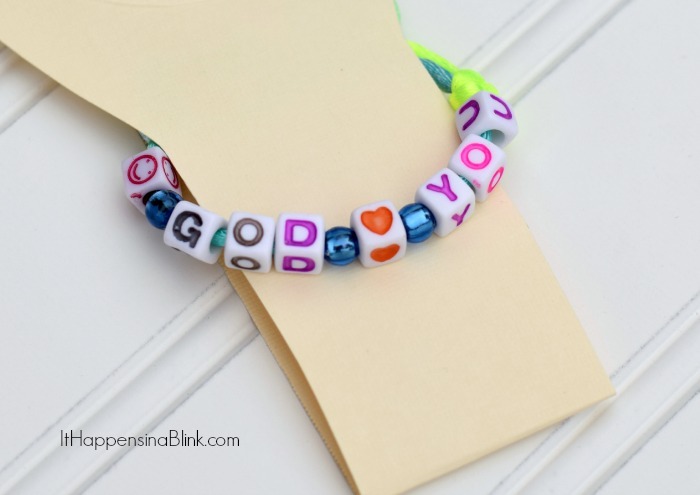 We are turning the focus this Valentine’s Day to God’s love for us with these God Loves U bracelets that we purchased from Family Christian. 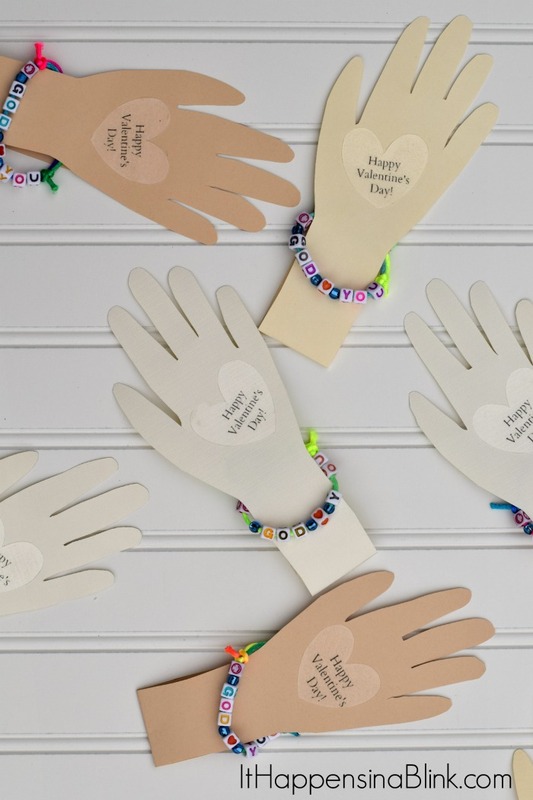 A special thanks to Family Christian for providing the bracelets for today’s Valentine’s Day craft! 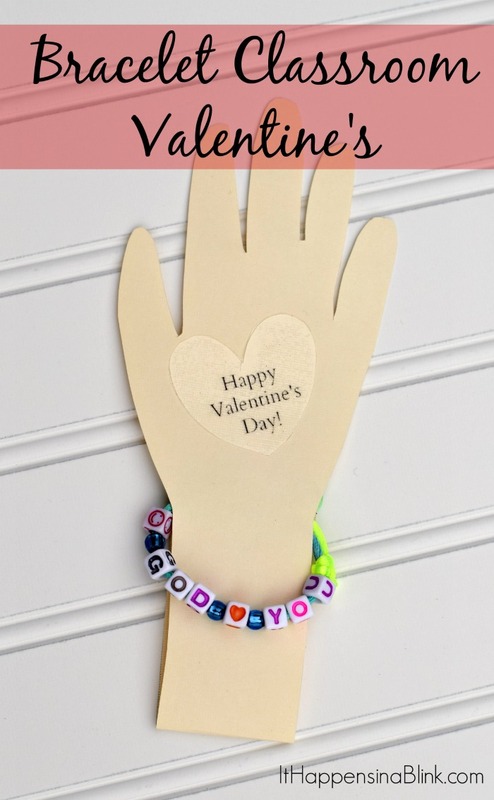 Since the craft also makes use of an outline of your little one’s hand, it can also be used as the basis for a great sentimental Valentine for grandparents. 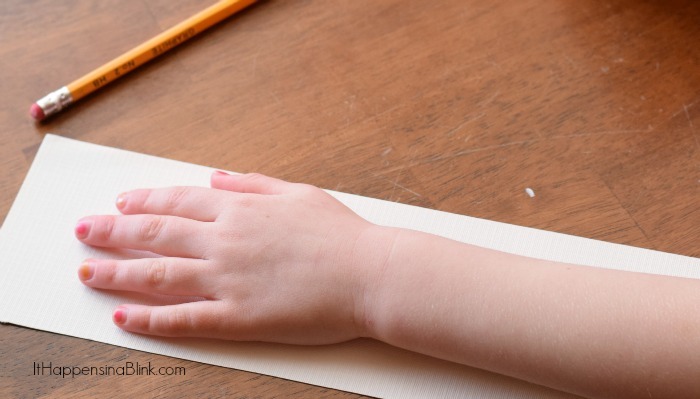 Begin by tracing an outline of your little one’s hand and half of the arm. Cut out the shape. 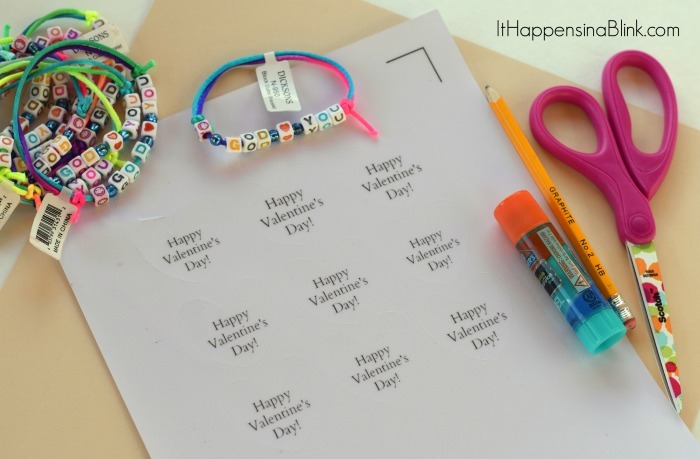 Use it as a template to trace and cut as many valentines as you need. 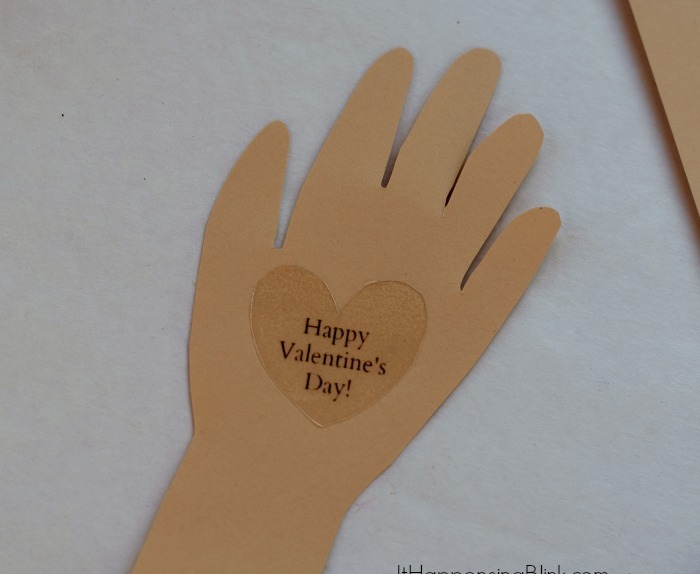 Add a “Happy Valentine’s Day” sticker to the center of the hand. These stickers can be purchased as most dollar stores. Slide the bracelet on the arm. Be sure the words are facing the correct way. Turn the arm over. 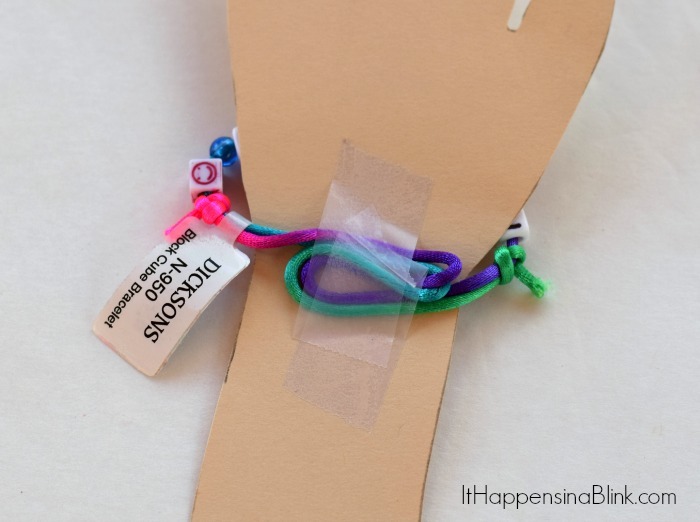 Fold the back of the bracelet and tape it so that it stays in place. 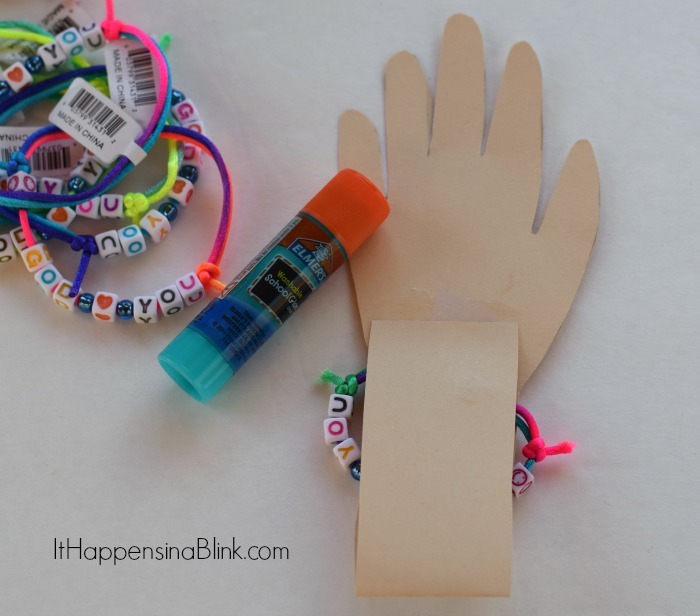 Tape it near the base of the hand so that the bracelet falls at the wrist. Examine the “arm” portion of the paper. If there is any curvature to the arm, cut it so that it is straight. In the next step, we will be folding this part up, and it’s important that it is even. Fold the arm portion in half and secure with glue. Alternatively, you could also use tape. My daughter wrote the name of the recipient on the back of the valentine. 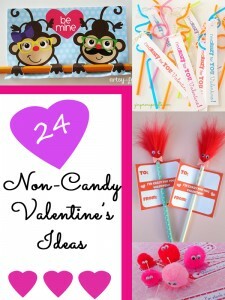 Want more non-candy Valentine’s Day ideas? Check out a few of these! 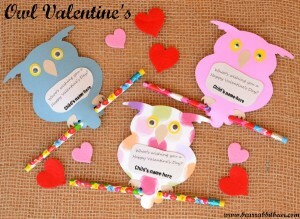 I think we will be making these for valentines this year! Such a cool idea! And yea, I’m that mom too. My kids can’t eat that colored candy or they walk on the ceiling with their behavior. But this? This is awesome. Such a great idea! This is something that the 5th grade girls my daughter talks about all the time will LOVE. 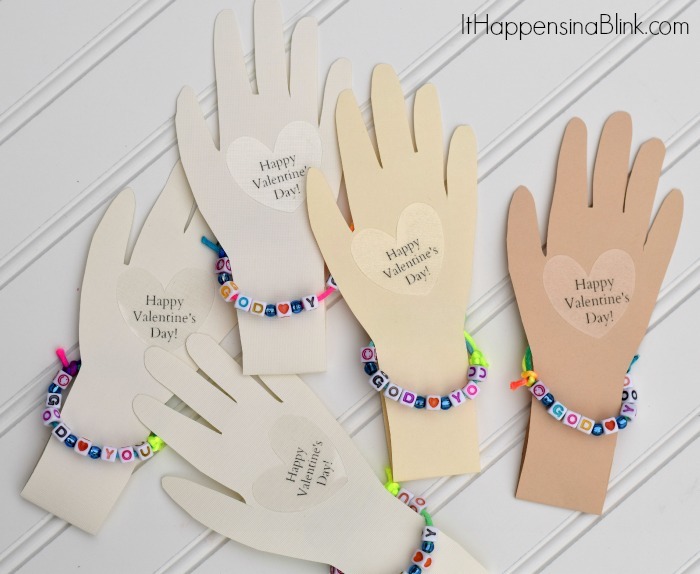 These are fantastic – what a great idea! Visiting from Practically Functional and pinning! Happy Friday and have a great weekend!